The main activity of HCP is to arrange personal equity finance for poor students so that they can go to University. However, we also try to help elsewhere when we can. In 2011 HCP coordinated the donation of 230 books from the University of Queensland School of Economics to the University of Management and Economics in Kampong Cham (UME-KC). 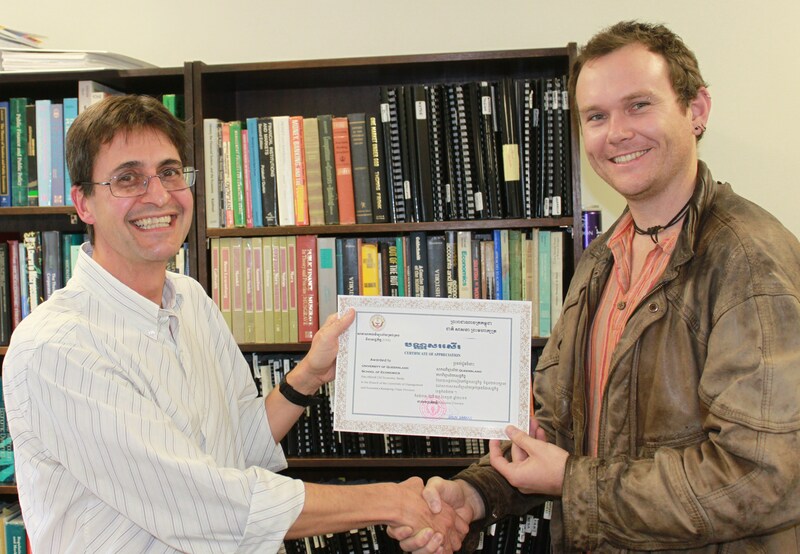 The below photo is John Humphreys (HCP) presenting Flavio Menezes (UQ economics) with a certificate of appreciation from UME-KC. In early 2015 HCP began a project (in cooperation with UME Kampong Cham) to build a share house where poor female students can live for free while studying. While HCP provides finance to pay for tuition, some people from the countryside are still unable to go to university because they cannot afford to rent accommodation in the city. Some men are able to stay for free at a Buddhist pagoda, but that is not an option for women. The university has given permission for us to build a share house on their land and thanks to the generosity of our supporters we have raised enough money to start building. HCP can also help to coordinate Australian graduates who are interested in working as a lecturer in Cambodia. If you have a degree in Business, Economics, Commerce, Tourism, Accounting, Marketing, Law or anything similar and would like to contribute to the education of many eager young Cambodian minds, then please contact John on john.humphreys99@gmail.com to discuss arrangements. You can stay for as short as a month or as long as you like, and while Cambodian Universities will not be able to offer you a proper wage, they will be able to help with accommodation and a wonderful experience. For shorter stays or people without University qualifications, you are welcome to join an English school in Kampong Cham for a day or two. The students always enjoy interacting with foreigners. Many of the staff and students associated with HCP are interested in the possibility of studying in Australia. AusAID does offer scholarships for foreign students to come and do postgraduate research in Australia. This how to apply guide gives the basics, though you need to apply before the cut-off date (around April or May each year). For further detail on Australian universities, you can search here.